A letter home. That could be the first small step to reconnecting homeless individuals with their loved ones, to re-establish a relationship long neglected, or simply to say “I’m ok”. 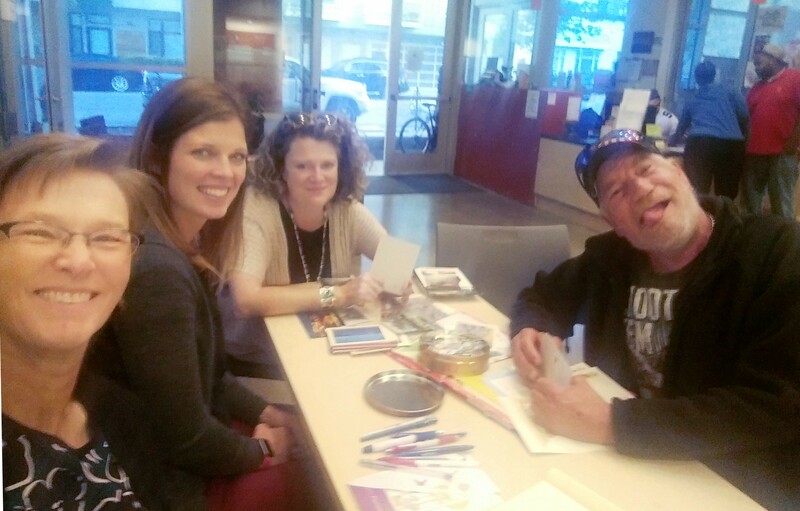 Free Letters Home™ offers the homeless community the opportunity to reestablish relationships and connect with loved ones via a mailed letter or card. Volunteers from this organization set up a table and offer greeting cards, postcards, stationery, stamps, help and encouragement in hopes that our guests will take the opportunity to write and mail a card or letter. 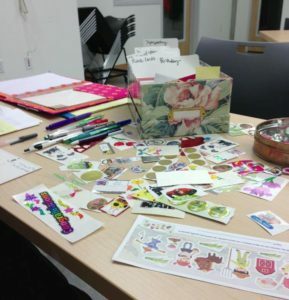 The support of Sustainable Ballard and its members through generous donations of cards, stamps, and volunteer hours has been key to the success of this project. At Free Letters Home™, we know we can’t solve all of someone’s problems with a letter and a stamp, but we can offer dignity and respect to our neighbors and let them know they are validated and cared about by the community. 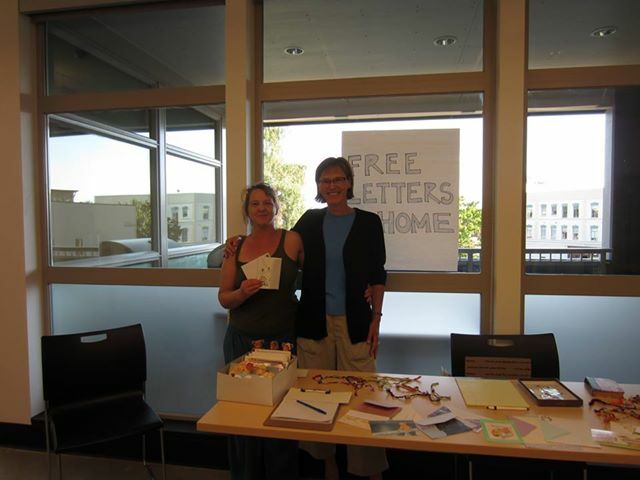 When Bev, the leader of this project, first read about Free Letters Home™ in a magazine, the power of that simple act struck her as something she could easily support. Then she checked out their website and saw that no one had yet volunteered to serve the Ballard area, and she thought “I can do that!”. Bev and her loyal volunteers have been going to Nyer Urness House on second Tuesday evenings monthly since July 2013. Over 300 pieces of mail have been sent. On July 11 of this year, we started a second monthly opportunity — on the second Wednesdays, 11:30am to 1pm, at Ballard Urban Rest Stop. Volunteers show up with supplies and serve about a half dozen people on each visit. Sometimes letters are already written and waiting for her to mail. Sometimes the sender needs a little more assistance (“I have lousy handwriting, can you write it for me?”). But mostly, volunteers just help people re-establish relationships. Like the woman who was thrilled to be able to write to friends and loved ones. The woman writing to her son, who is in prison. Or the man who hadn’t spoken with his brothers since their father passed away, and wanted to reconnect. That’s what it’s all about. I am sure that I even saw a few skips of joy in her feet as she left the table to get started on her letter. Volunteer! To help on Tuesday evenings, contact Bev; to help on Wednesdays, contact Kate. 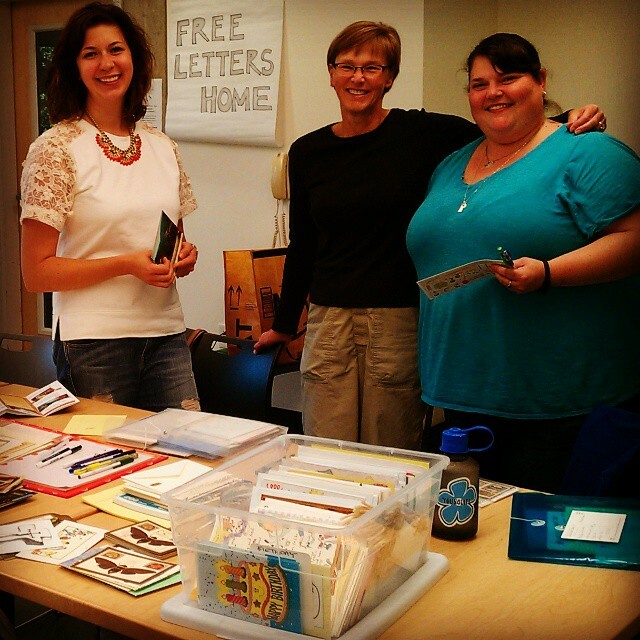 Donate supplies: Stamps, stationary, envelopes, stickers and pens are always needed. 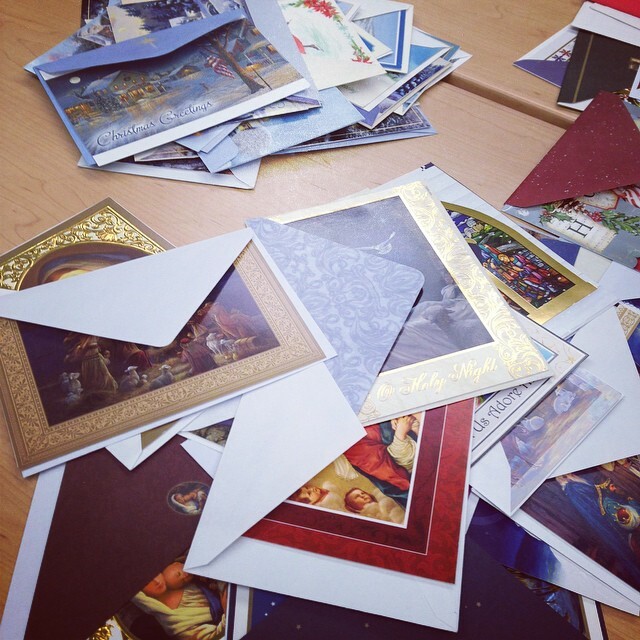 Holiday card donations are also needed. While some people like writing their own words, others prefer a pre-written message. Mail donations to Free Letters Home, 5403 W. Highland Road, Everett, WA 98203 (which distributes st arter kits to new volunteers) or contact Bev directly at the link below.